Gas detector tubes are successfully used for the quick measurement of harmful gases and vapours in the atmosphere and also the distribution of their concentration in the working area. Available to prevent fire and explosion by detecting combustible gases leaked or generated in workplaces, and by foreseeing spontaneous combustion in coal mines. In case gases are used as material or intermediates in various industries, impurities in the gas are measured by gas detector tubes in order to make products' quality up and production efficiency up by preventing deterioration of catalysts. Flue gases such as Nitrogen compounds, SO2, CO, CO2, HCI and O2 are possible to measure economically together with Model P-10FG Flue gas sampler for air pollution control. Effluent can be analysed for certain types of pollution. The method is so simple and quick, accordingly instant checks can be made almost anywhere. with Model AP-1 aspirating pump and standard accessories which are composed of a carrying case, 3 pcs. of rubber tube connector, 1 pce. of grease and an instruction manual. 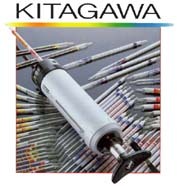 The principle of Kitagawa Gas Detector Tube System is a dry analysis method that makes an application of a chemical reaction and a physical absorption. 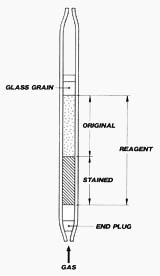 In sampling a gas into a detector tube, a stained layer can be produced by means of the reaction of the reagent and gas in the tube. As the gas concentration is proportional to the length of stained layer, you can easily read off the concentration on the top of stained layer. The reading methods of gas concentration are divided into two ways; a directly reading method of which reading can be obtained directly from the scale printed on the tube and a concentration chart method. The gas detector tube has many applications as stated below and many advantages which other analysis methods do not have. Measurements of working environment: The gas detector tube is used for measuring quickly concentrations of harmful gases and vapor in working environment and for grasping their concentration distributions in work sites. It is also used for the measurement of comparatively thick harmful gases or vapors in open tanks, painting rooms, plating tanks, electrolytic cells, storage sheds and gas leaking places, and the efficiencies of local exhaust system, overall ventilator and air purifier. Measurements for the environmental sanitation of buildings and offices: In the closed room, the concentrations of harmful gases as carbon monoxide and carbon dioxide are increased by respiration of human bodies. Measuring the efficiencies of the ventilation by using gas detector tube is effective for human bodies and working efficiencies. Measurements for the sanitation of schools and as teaching material: It is widely used as teaching material for health education, physical education and science. Measurements of pollutants in the atmosphere: In this case, it is necessary to measure much lower concentration than the allowable concentration for industrial hygiene. That is because allowable concentration for living environment should be considered to be 1/10 to 1/100 of that for industrial hygiene. Gas detector tubes can be also used for this purpose. Measurements of pollutants in flue gas: Measurement of pollutants in flue gas is important for the prevention of air pollution. The Japanese Industrial Standards(JIS) provides various kinds of test methods as analysis methods for flue gas, of which the simplest one is the gas detector tube method, all other methods being very complicated. Measurement of harmful gases is ships: It is used for the measurements of harmful gases in ships in conformity with the IMO rule. Process control: When gas is used as raw material in chemical and other industries, it happens that a very small quantity of impurity poisons the catalyst or gives bad effect on the quality of products. Therefore, it is necessary to measure and control this very small quantity of impurity. Furthermore, it is necessary to measure impure gas in products, mixing ratios of gas materials and composition of exhaust gas. The gas detector tube is used for testing the purity of gas in this kind of quality control. Mine safety: Pit fire or gas explosion caused by the spontaneous ignition of coals in the pit frequently occurs in mines. Such spontaneous ignition can be discovered at its early stage by detecting a very small quantity of carbon monoxide or of ethylene co-existing with the carbon monoxide by using detector tube. 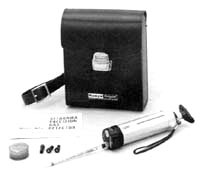 The detector tube is also used for the measurement of carbon monoxide after pit fire or explosion. Prevention of gas explosion: The concentration of inflammable gas in air or gas can be measured safely and quickly by the detector tube method. The measurement does not require any power source such as battery or heat source, so can be performed without any danger, providing no ignition source even in the presence of explosive mixed gas. For instance, tank explosion accident can be prevented by measuring acetylene generated in the carbide tank or tank lorry. Combustion inspection of gas apparatuses: Combustion condition of gas apparatuses after gas conversion can be inspected by detector tube for carbon monoxide. Measurement of alcohol in drunken person's breath: Breath alcohol detector tube is used by police stations of the metropolis and prefectures of Japan for the control of driving by drunken persons. Others: Detection of arsenic in foods: measurement of formaldehyde vapor generated from textile products; measurement of various kinds of ion. 604SP Compressed breathing air test tube (O2) 800B Charcoal tube 801 Silica-gel tube * marked items are New Detector Tubes.